The longer I sit, the less inclined I am to stand up is a video installation exploring our constant quest for self improvement and the celebrity cult of the chef. Participants are filmed cooking in real-time to the instruction provided by an episode of 30 Minute Meals with Rachael Ray. The process is documented with a hand-held video camera. The audio features the voice of Rachael Ray narrating her endeavours on the TV program, mingling with the cooking sounds generated by the participant. This work was originally exhibited in 2006 as part of the Third Floor Emerging Artist Series at the Rochester Art Center, Rochester, Minnesota. Kris Douglas, Chief Curator at the Rochester Art Center wrote the essay for the catalogue. 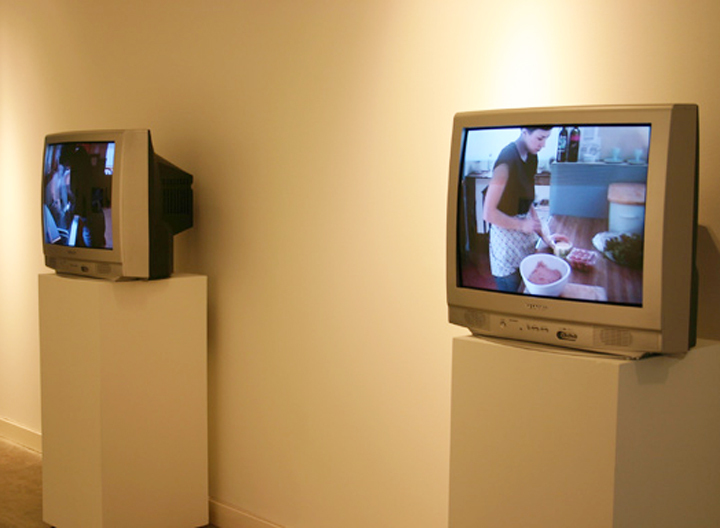 In 2007 the work was extended from eight monitors to sixteen to be exhibited as a Special Project at artDC, the inaugral art fair held in the Washington Convention Center in DC.